Rohini D. Samudralwar, MD, received her medical degree from Drexel University College of Medicine and her undergraduate degree from Drexel University. After completing her residency and internship in the department of Neurology at Baylor College of Medicine in Houston, where she held the position of chief resident, she then went on to complete a fellowship in neuroimmunology and neuroinfectious diseases at Washington University in St. Louis. There, she also earned a graduate certificate in clinical investigation. Dr. Samudralwar's clinical interests include neurosarcoidosis, neuroinfectious diseases/global health, multiple sclerosis and neuromyelitis optica. Affiliated with Memorial Hermann-Texas Medical Center, Dr. Samudralwar sees patients at UT Physicians Neurology – Texas Medical Center and UT Physicians Multiple Sclerosis and Neuroimmunology Division – Texas Medical Center. 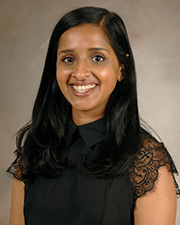 As an Assistant Professor in the department of Neurology at McGovern Medical School at The University of Texas Health Science Center at Houston, Dr. Samudralwar has co-authored multiple articles in medical journals, including International Journal of Alzheimer’s Disease, Neurology and International Journal of Multiple Sclerosis Care, as well as multiple abstracts and posters.